DAB specialist Pure Digital went live yesterday with a charity auction site full of DAB radios signed by rock's elite. 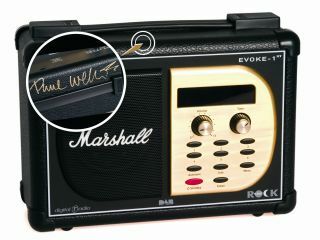 The company is auctioning a number of special rock-tastic Marshall-edition Evoke 1-XT radios, all signed by big-name rock stars. Pure's Evoke 1-XT normally costs £100, but to a collector the signed versions - which come complete with a certificate of authenticity - are priceless. All of the proceeds from the auction go towards Nordoff-Robbins Music Therapy, a charitable foundation that provides music therapy for children and adults in need, as well as training for people who want to become music therapists or further their education for the charity. Although DAB digital radio is widespread in the UK, Scandinavia, Switzerland, Belgium and other parts of Europe, DAB digital radios do not work in the USA or Japan. Winning bids from the UK and Europe will receive units supplied with the appropriate power supplies. However, whether DAB is available in your country or not, the signed radios are undoubtedly a piece of rock history, and it's all for 'charidee', mate. Bidding has already begun on signed radios from the likes of Lemmy from Motorhead, Noel Gallagher, Pink Floyd's Nick Mason and Paul Weller.